Sidney D. Gamble (1890-1968), an avid amateur photographer, began taking pictures in China during his first trip to the country with his family in 1908. He returned three more times between 1917 and 1932 and continued photographing the daily life of Chinese citizens. A sociologist and renowned China scholar, he traveled throughout the country to collect data for social-economic surveys and to photograph urban and rural life, public events, architecture, religious statuary, and the countryside. The exhibition will show 8o photographs that capture China at the brink of the modern era as its last dynasty gave way to a fledgling republic in the early 20th century. Gamble used a few of the photographs from his extensive collection in his scholarly publications and in slide lectures, but the majority of images were never published or exhibited during his lifetime. The exhibition will also include a video of film footage taken by Gamble in China. 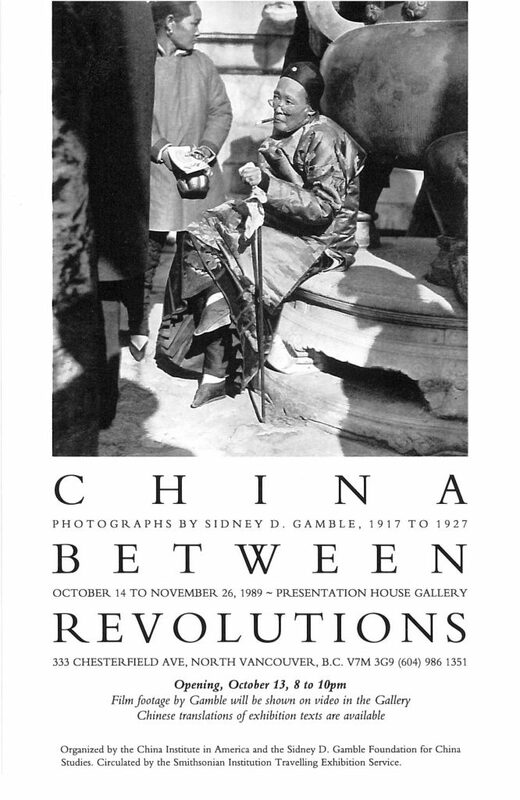 Poster for the exhibition "China Between Revolutions: Photographs by Sidney D. Gamble, 1917-1927"